Do not confuse with his father, Grand Duke Nicholas Nikolaevich of Russia (1831-1891). Grand Duke Nikolay Nikolayevich Romanov of Russia (Russian: Николай Николаевич Романов (младший - the younger)) (November 6, 1856 - January 5, 1929) was a Russian general in World War I. 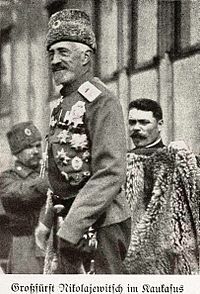 A grandson of Nicholas I of Russia, he was commander in chief of the Russian armies on the main front in the first year of the war, and was later a successful commander in the Caucasus. Nicholas, named after his paternal grandfather the emperor, was born as the eldest son to Grand Duke Nicholas Nicolaevich of Russia (1831-1891) and Alexandra Petrovna of Oldenburg (1838-1900). His father was the sixth child and third son born to Nicholas I of Russia and his Empress consort Alexandra Fedorovna of Prussia (1798-1860). Alexandra Fedorovna was a daughter of Frederick William III of Prussia and Louise of Mecklenburg-Strelitz. Nicholas' mother, his father's first cousin's daughter, was a daughter of Duke Konstantin Peter of Oldenburg (1812-1881) and Princess Therese of Nassau (1815-1871). His maternal grandfather was a son of Duke George of Oldenburg and Grand Duchess Catherine Pavlovna of Russia, daughter of Paul I of Russia and Maria Fedorovna of Wx�rttemberg. (Catherine was later remarried to William I of Wx�rttemberg.) His maternal grandmother was a daughter of Wilhelm, Duke of Nassau (1792-1839) and Princess Luise of Saxe-Hildburghausen. The Duke of Nassau was a son of Friedrich Wilhelm, Duke of Nassau (1768-1816) and Burgravine Louise Isabelle of Kirchberg. His paternal grandparents were Duke Karl Christian of Nassau-Weilburg (1735-1788) and Carolina of Orange-Nassau. Carolina was a daughter of William IV of Orange and Anne, Princess Royal of Great Britain. Anne was the eldest daughter of George II of Great Britain and Caroline of Ansbach. Grand Duke Nicholas was the first cousin once removed of the Tsar Nicholas II. To distinguish both of them, the Grand Duke was often known within the Imperial family as Nikolasha. The Grand Duke also towered over the Tsar, so they were nicknamed "Nicholas the Tall" and "Nicholas the Short", respectively. Picture - Grand Duke Nikolai Nikolaevich. Grand Duke Nicholas was educated at the school of military engineers and received his commission in 1872. During the Russo-Turkish War, 1877-78, he was on the staff of his father who was commander in chief. He distinguished himself on two occasions in this war. He worked his way up through all the ranks until he was appointed commander of the Guard Hussar Regiment in 1884. He had a reputation as a tough commander, yet one respected by his troops. His experience was more as a trainer of soldiers than a leader in battle. Nicholas was a very religious man, praying in the morning and at night as well as before and after meals. He was happiest in the country, hunting or caring for his estates. Nicholas was a panslavist nationalist, though not a radical one. 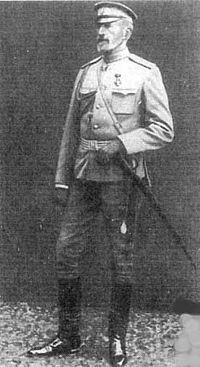 By 1895, he was inspector-general of the cavalry, a post he held for 10 years. His tenure has been judged a success with reforms in training, cavalry schools, cavalry reserves and the remount services. He was not given an active command during the Russo-Japanese War, perhaps because the Czar did not wish to hazard the prestige of the Romanovs and because he wanted a loyal general in command at home in case of domestic disturbances. Thus, Nicholas did not have the opportunity to gain experience in battlefield command. Grand Duke Nicholas played a crucial role during the first Russian Rebellion of 1905. With anarchy spreading and the future of the dynasty at stake, the Czar had a choice of instituting the reforms suggested by Count Sergei Witte or imposing a military dictatorship. The only man with the prestige to keep the allegiance of the army in such a coup was the Grand Duke. The Czar asked him to assume the role of a military dictator. In an emotional scene at the palace, Nicholas refused, drew his pistol and threatened to shoot himself on the spot if the Czar did not endorse Witte's plan. This act was decisive in forcing Nicholas II to agree to the reforms. Empress Alexandra (born Alix of Hesse-Darmstadt), a convinced autocrat, never forgave the Grand Duke. From 1905 to the outbreak of World War I, he was commander-in-chief of the St. Petersburg Military District. He had the reputation there of appointing men of humble origins to positions of authority. The lessons of the Russo-Japanese War were drilled into his men. On April 29, 1907, Nicholas married Princess Anastasia of Montenegro, the daughter of King Nicholas of Montenegro. She had previously been married to George Maximilianovich, 6th Duke of Leuchtenberg until their divorce in 1906. Their marriage was a happy one. Both were deeply religious Orthodox Christians, with a tendency to mysticism. Since the Montenegrins were a fiercely Slavic, anti-Turkish people from the Balkans, Anastasia reinforced the Pan-Slavic tendencies of Nicholas. They had no children. Nicholas was one of the great hunters of his day. Ownership of borzoi hounds was restricted to members of the highest nobility, and Nicholas's packs were famous. As the Russian dogs perished in the Revolution of 1917-18, the borzoi of today are descended from gifts he made to European friends before World War I. In his lifetime, Nicholas and his dogs caught hundreds of wolves. A pair of borzoi were used which caught the wolf, one on each side, while Nicholas dismounted and cut the wolf's throat with a knife. A hard working man, hunting was his major recreation, and he travelled in his private train across Russia with his horses and dogs, hunting while on his rounds of inspection. The Grand Duke had no part in the planning and preparations for World War I, that being the responsibility of General Vladimir Sukhomlinov and the general staff. On the eve of the outbreak of World War I, his first cousin once removed, the Emperor Nicholas II of Russia, yielded to the entreaties of his ministers and appointed Grand Duke Nicholas to the supreme command. He was 57 years old and had never commanded armies in the field before. He was given responsibility for the largest army ever put into the field in all prior history. Grand Duke Nicholas was responsible for all Russian forces fighting against Germany, Austria-Hungary, and Turkey. Initially, the Russian high command was not up to the challenge of the Great War. Different armies failed to coordinate their actions which resulted in the disaster of Tannenberg. The subsequent Battle of the Vistula River and Battle of Łx�dź were more successful for Russian army. The Grand Duke's role was limited to picking and choosing from the various plans offered by the many Russian Army Generals. No coherent plan for victory emerged from the Grand Duke or his staff, though on a personal level he was well liked by both officers and the troops. Nicholas seems to have been more a bureaucrat than a military leader, lacking the broad strategic sense and the ruthless drive to command all the Russian armies. His headquarters had a curiously calm atmosphere, despite the many defeats and the millions of casualties. It must be admitted that the Russian army did not perform any better with his cousin, the Tsar, in charge of the war. On March 22, 1915 he reсeived Order of St. George 2nd degree for the successful Siege of Przemyśl. After the strategic retreat of the Russian army (and at the suggestion of Grigori Rasputin, the Imperial Family's spiritual advisor), the Tsar replaced the Grand Duke as commander of the Russian armed forces on August 21, 1915. Upon his dismissal, the Grand Duke was immediately appointed commander-in-chief and viceroy in the Caucasus area (taking over for the old Governor General Illarion Vorontsov). While the Grand Duke was officially in command, General Yudenich was the driving figure in the Russian Caucusus army. Their opponent was the Ottoman Empire. While the Grand Duke was in command, the Russian army sent an expeditionary force through to Persia (now Iran) to link up with British troops. Also in 1916, the Russian army captured the Fortress of Erzerum, the port of Trebizond (now Trabzon) and the town of Erzincan. The Turks responded with an offensive of their own. Fighting around Lake Van swung back and forth, but ultimately proved inconclusive. Nicholas tried to have a railway built from Russian Georgia to the conquered territories with a view to bringing up more supplies for a new offensive in 1917. But, in March 1917, the Tsar was overthrown and the Russian army began to slowly fall apart. The February Revolution found Nicholas in the Caucasus. He was appointed by the Emperor, in his last official act, as the supreme commander in chief, and was wildly received as he journeyed to headquarters in Mogilev; however, within 24 hours of his arrival, the new premier, Prince Georgy Lvov, cancelled his appointment. Nicholas spent the next two years in the Crimea, sometimes under house arrest, taking little part in politics. There appears to have been some sentiment to have him head the White Russian forces active in southern Russia at the time, but the leaders in charge, especially General Anton Denikin, were afraid that a strong monarchist figurehead would alienate the more left leaning constituents of the movement. He and his wife escaped just ahead of the Red Army in April 1919, aboard the British Battleship HMS Marlborough. On August 8, 1922, Nicholas was proclaimed as the emperor of all Russia by the Zemsky Sobor of the Preamursk region by general Mikhail Diterikhs. The former was already living abroad and consequently was not present. Two months later the Preamursk region fell to the Bolsheviks. After a stay in Genoa as a guest of his brother-in-law, Victor Emmanuel III, King of Italy, Nicholas and his wife took up residence in a small country house at Choigny, 20 miles outside of Paris. He was under the protection of the French secret police as well as by a small number of faithful Cossack retainers. He became the center of an anti-Soviet monarchist resistance group, and headed the Russian All Military Union alongside general Pyotr Wrangel. Plans were made by them to send their agents into Russia. Conversely a top priority of the Soviet secret police was to penetrate this monarchist organization and to kidnap Nicholas. They were successful in the former, infiltrating the group with spies, and later luring the anti-Bolshevik British master spy Sidney Reilly back to the Soviet Union where he was killed. They did not succeed however, with kidnapping Nicholas. As late as June 1927, the monarchists were able to set off a bomb at the Lubyanka Prison in Moscow. Grand Duke Nicholas died on January 5, 1929 of natural causes on the French Riviera, where he had gone to escape the rigors of winter. Grand Duke Nicholas was portrayed in the 1971 movie Nicholas and Alexandra by Harry Andrews.